How do I backup my device contents? How do I backup contacts from my device? How do I backup photos/videos from my device? How do I backup calendar events from my device? How does 'Auto Camera Upload' work? I started backing up my photos few hours back. Why isn't it backed up yet? What is sync and how does it work? How do I enable sync from my mobile? How do I sync files from my mobile? How do I download synced files? How do I restore an earlier version of a synced file? How do I unlink a device from my account? Can I access my IDrive account on my mobile? Can I access my mobile backup data through web? How do I view the files/folders shared with me? What operations can I perform on the photos/videos using Timeline? Can I edit backed up files on my mobile? How do I search files in IDrive account from my mobile? What is Offline View and how do I add files to Offline View? How do I share my photos/videos? Where are my shared files located? How do I restore any device contents? How do I restore photos/videos to my device? How can I restore calendar events to my device? How do I restore contacts to my device? How do I restore health data to my device? How can I cancel an upload while it is in progress? How does the facial recognition feature work in IDrive? What operations can I perform via ‘People’? Can I use the same name for two different faces? I have uploaded some photos but am not able to find them in the People section. Why is that? Which file formats are supported for facial recognition in IDrive? What will happen to the already existing photos in my IDrive account? For the first time when you log in to the IDrive app, the 'Backup' screen appears. 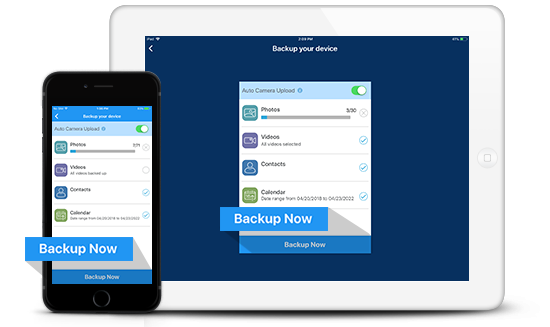 You can backup all your device contacts, calendar events, photos, and videos, to your IDrive account by tapping on 'Backup Now'. You can also customize your selection of items considered for backup and then tap 'Backup Now'. On the IDrive app home screen, tap 'Backup' under Cloud Backup. Select 'Contacts' and then tap 'Backup Now'. All backed up contacts are available in 'My iPhone/iPad Backup' folder. On the IDrive app home screen, tap 'Backup'. Select 'Photos' or 'Videos' for backup, and then tap 'Backup Now'. Select photos/videos you wish to backup. Tap 'Done' and then tap 'Backup Now'. All backed up photos/videos are available in 'My iPhone/iPad Backup' folder. Select 'Calendar' and then tap 'Backup Now'. Select 'Calendar', choose the 'Start Date' and 'End Date'. All backed up calendar events are available in 'My iPhone/iPad Backup' folder. The Background Upload option lets you continue your uploads in the background and perform other activities without having to continuously monitor the upload process. Background upload in iOS will stop within few minutes after the application is closed; however, the application resumes the upload process whenever the IDrive app detects a change in device location. This is designed to let your camera uploads work more efficiently. You can enable the 'Background Upload' option from the 'Settings' tab. Select 'Allow'/'Always Allow' option in the confirmation popup, while enabling background upload to continue uploads in the background. Note: The app will ask for permission to access your photos as Apple privacy settings for photos and location services are different. In both cases the app will not be able to upload photos and videos to your account, unless permitted. When the Background Upload option is enabled, you'll see the location services arrow appear at the top of the screen. This icon indicates that an app (such as a mapping app) is using your iPhone's GPS system to keep track of your precise location. It also consumes a lot of battery in the process. However, IDrive's background upload feature uses a low-power version of Apple's location services. With 'Auto Camera Upload', you can automatically backup all the photos and videos from your device Camera Roll to IDrive account. Additionally, all live captures are also automatically backed up. On your first login, the 'Auto Camera Upload' option is set to OFF. Tap 'Auto Camera Upload' to enable. All the photos and videos automatically backed up are stored in 'My iPhone'/'iPad Backup' > 'Photos'/'Videos' > 'Camera Roll' folder in your IDrive account. If you have a large number of files to be backed up, make sure you keep the application open till the backup is complete. If you close the app, upload may pause. To complete backup without interruption, we recommend you to connect your device to a charger and leave the application open. Photos, videos, contacts and calendar events are uploaded incrementally. This means that after initial backup, following backups will upload only newly added or modified files. IDrive links all of your devices such that whenever a file is updated, it is instantly available on all linked devices. For syncing files, IDrive creates a unique folder on every linked computer and provides separate cloud storage. You can sync files using the Sync folder on linked desktops, or directly via IDrive.com and mobile apps. On the IDrive app home screen, tap . Go to 'Sync', and tap 'Enable Sync'. You need to enable Sync to be able to sync files from your mobile. On the IDrive app home screen, tap and then tap 'Sync'. Select ‘Upload Photos / Videos’ and choose photos or videos to upload. Alternatively, you can ‘Browse’ and choose photos or videos to upload. File upload will start automatically, if you select the 'Capture and Upload' option. Currently, you can only sync photos and videos from iOS device. Tap corresponding to file/folder to download. Tap and then select 'Edit/Share'. Select the files/folders and tap 'Restore'. Note: Only files compatible to your iOS device will be restored. Browse and open the file. Tap ; the 'Versions' screen is displayed. Select the desired version and tap 'Done'. Unlinking a device, logs you out of the IDrive application on the particular device. On the IDrive app home screen, tap and then tap 'Settings'. Tap corresponding to the device you want to unlink. Alternatively, simply log out of the IDrive app to unlink your iOS device. You can perform all file/folder operations like cut, copy, rename, delete and create a new folder through your mobile device. Yes, you can access your IDrive account on your mobile. Download and install the IDrive app on your mobile. Log in to the application using your IDrive credentials. If you do not have an IDrive account, sign up for a new account. Note: In case, you have a private encryption key set for your IDrive account, you must enter your private key to access your account. 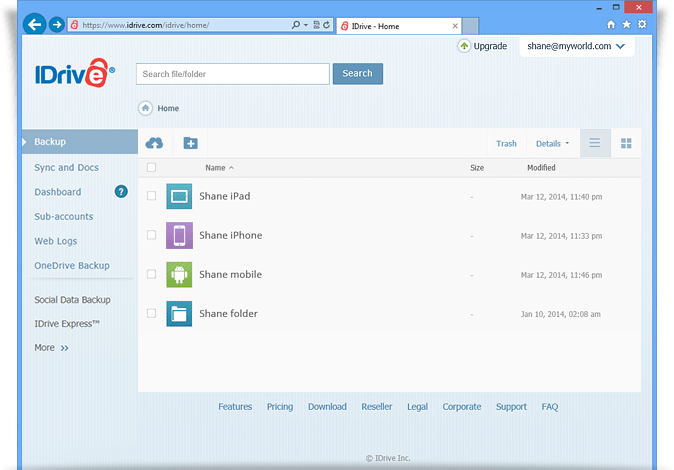 You can browse, search and access all the files/folders in your IDrive account. Yes, you can access your mobile backup data through the web by logging to your IDrive account via any web browser. Select the folder with your phone name, and access Calendar, Contacts, Photos and Videos backed up to your IDrive account. To view shared files and folders, open the link shared with you using the IDrive app. The shared files and folders appear in the 'Shared With Me' tab of the app. Note: You can also view the shared files/folders using a web browser. The Timeline displays all the photos and videos backed up from multiple mobile devices, sorted by date and location. Using Timeline, you can share, download, and delete your photos/videos, backed up with IDrive. To view a list of your photos and videos, on the IDrive app home screen tap 'Timeline'. Using Timeline, you can share, download, and delete your mobile photos/videos, backed up with IDrive. On the home screen tap 'Timeline'. A list of your backed up photos and videos sorted in descending order appears. Select the required media files and tap . Tap 'Share', enter the email addresses and tap 'Send'. Tap , select the required media files and tap 'Restore' to download the files to your device. Select a photo and then tap . You will be prompted with a message. Tap 'Delete'. No, you cannot edit your IDrive account files on your mobile. However, you can view them. How do I search files in the IDrive account from my mobile? On the IDrive app home screen, tap 'Access and Restore'. Enter the complete or part of the file name in the search bar. Offline View allows you to view your files even when there is no Internet connectivity. Select 'My iPhone/iPad Backup' or any other device folder. Select the files/folders and tap 'More'. Tap the 'Contacts' folder and tap . Select contacts and tap 'Share'. On the share screen, enter email address of the recipient and tap ‘Send’. Note: The Share option is available only for IDrive accounts with default encryption. Tap , and then select 'Edit/Share'. Select the photos/videos and tap 'Share'. On the share screen, enter email address of the recipient with message if any and tap 'Send'. IDrive provides a centralized location for all your shared files. 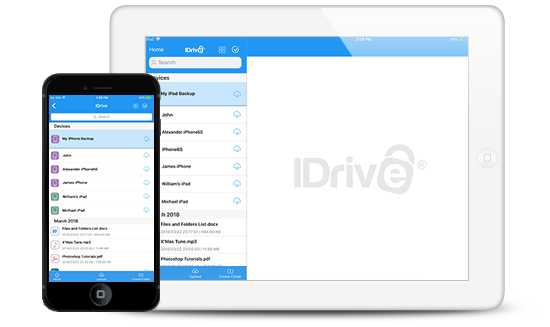 You can view the files that you've shared with others and the files shared with you by other IDrive users. The shared files pinned to your IDrive account does not impact your account’s quota. On the IDrive app home screen, tap > 'Manage Sharing'. Tap 'Shared by me' or 'Shared with me' to view the shared files. Tap corresponding to the folder you wish to restore, and then tap ‘Restore’. Tap corresponding to the 'Photos'/'Videos' folder and tap ‘Restore’ to restore all your photos/videos. Tap the 'Photos'/'Videos' folder and then tap . Select the photos/videos to restore, and then tap 'Restore'. Select 'My iPhone/iPad Backup' or any other mobile device folder. Tap corresponding to the 'Calendar' folder and tap 'Restore' to restore all your calendar events. Select the calendar events to restore, and then tap 'Restore'. You can restore your device contacts from your IDrive account. Select 'My iPhone/iPad Backup' folder or any other mobile device folder. Tap corresponding to 'Contacts' folder and select ‘Restore’ to restore all your contacts. Select the contacts to restore, and then tap 'Restore'. Select 'Simply Restore to Address Book' or 'Delete Address Book & Restore'. Note: To restore earlier versions of your contacts from your device, tap 'Contacts' > 'Version' and choose the desired version. Tap corresponding to the 'Health' folder and select 'Restore' to restore all your health data. Enter a name for the new folder and tap 'Create'. Tap next to the file and change the name of the file. Note: Default folders and device names cannot be renamed. Go to the file/folder being uploaded. Tap next to the file or folder name, to cancel the upload. Select the folder you want to delete and tap 'More'. Navigate to the folder which contains the file to be deleted. Select the file you want to delete and tap 'More'. IDrive uses facial recognition to identify faces from your backed up photos and uses each faceprint to group your photos. The 'People' section in the app provides a thumbnail view of all the face groups created. You can tap a thumbnail to view all the photos linked to that faceprint. What operations can I perform via 'People'? You can add names for faces, easily search and share photos from the 'People' section in the IDrive app. On the IDrive app home screen, tap 'People'. Tap the thumbnail you want to add a name to, and tap 'Add name'. Enter a name and tap 'Done'. To edit names, tap corresponding to the name, enter a new name and tap 'Done'. To remove a name, tap the name, clear the field and and tap 'Done'. To search for photos of a particular person, enter the name of the individual in the search field or tap the respective thumbnail. When you search with two names, photos that include the two faces will appear in the results. Note: You can enter only two names at a time, separated by comma. Tap the photo you want to share, tap and tap ‘Share’. Enter the email address of the recipient(s). Enter the message and tap ‘Send’ to share the photo with your associates. Tap the photo you want to delete and tap . Tap 'Delete' in the confirmation window to delete the selected media file from your IDrive account. Note: You can only delete/share one photo at a time. Bulk selection of photos is not allowed. No, you cannot use the same name for two different faces. If you try to add a name which is already existing, the IDrive app will prompt you to use a different name. The number of photos uploaded is less than 20. Photos are uploaded using the desktop application or web console. Only device folder photos detected via facial recognition will be displayed under People. The uploaded photos do not contain any human face. The number of photos detected for a face is less than 5. The file formats supported for facial recognition are JPG, JPEG, PNG, HEIC, BMP and NEF. Other file formats and rotated images may not be detected. After upgrading to the latest version, it may take some time for all your existing photos to be identified by the facial recognition technique. The time taken will depend on the number of already existing photos in your account. * Note: For some accounts, certain features like People and functions like copy, move, and rename are not available. How do I backup SMS from my device? How do I backup my music files from my device? How do I backup call logs from my device? How do I backup other file types, such as my SD card, from my Android device? Can I perform automatic data backups? What is Timeline? How can I access Timeline? How to restore calendar events to my device? How do I restore SMS to my device? How do I restore call logs to my device? How do I restore music to my device? How do I download backed up apps to my device? How do I restore other file types to my device? Where does IDrive store my restored files on my device? How to cancel an upload while it is in progress? Why does the IDrive mobile app need to access my personal information? Will IDrive save or share my information? Can I use the IDrive mobile app without giving access to the required permissions? 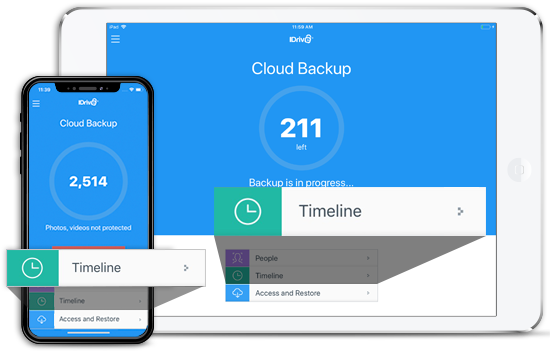 When you login to the IDrive app, you will have the option to backup all your device contacts, calendar events, photos, videos, music, SMS, call logs, and other files to your IDrive account by tapping on 'Backup Now'. You can customize the selection based on your requirement and tap 'Backup Now'. 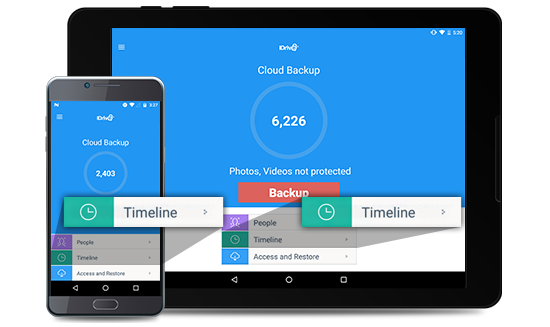 For subsequent backups, tap 'Backup' under Cloud Backup from the home screen and choose the contents for backup. Select 'Contacts' and tap 'Backup Now'. All backed up contacts will be available in 'My Device Backup' folder. Select 'Photos' or 'Videos' to backup. All backed up photos/videos will be available in 'My Device Backup' folder. Tap 'Add-ons' -> 'Calendar' and then tap 'Backup Now'. All backed up calendar events will be available in 'My Device Backup' folder. Tap 'Add-ons' -> 'SMS' and then tap 'Backup Now'. All backed up SMS will be available in 'My Device Backup' folder. Tap 'Add-ons' -> 'Music' and tap 'Backup Now'. All backed up music files will be available in 'My Device Backup' folder. Tap 'Add-ons' -> 'Call Logs' and tap 'Backup Now'. All backed up call logs will be available in 'My Device Backup' folder. Tap 'Add-ons' -> 'Other Files' and tap 'Backup Now', to backup all the files from your SD card. Tap the 'Other Files' folder and then navigate to the files. Select the files using . All backed up files will be available in 'My Device Backup' folder. When you select the ‘Other Files’ folder, you should see all of your backed up data here with the exception of Photos, Videos, and Music. These will be located in their respective folders. With 'Auto Camera Upload', you can automatically backup all the photos and videos from your device gallery to your IDrive account. Additionally, all live captures are also automatically backed up. On your first login, the 'Auto Camera Upload' option is set to ‘OFF’. Drag the 'Auto Camera Upload' slider to switch it ON. 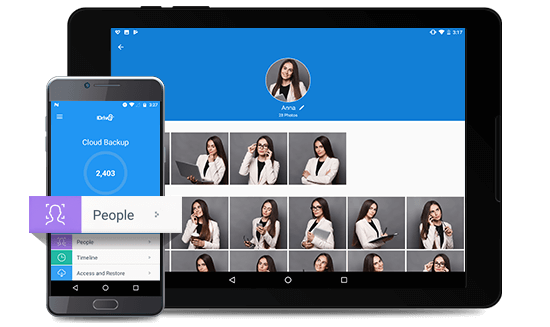 All the photos and videos automatically backed up are stored in ‘My Device Backup’ > ‘Photos’/’Videos’ folder in your IDrive account. Photos, videos, and music files are uploaded incrementally. That means that after the initial backup is done, following backups will upload only newly added or modified files. Contacts, Calendar, SMS, Call logs, and Documents (Other files) are not incremental and will re-upload each time a backup runs and create versions. So, for example, Call Logs can be easily restored from a backup that took place on a certain date. 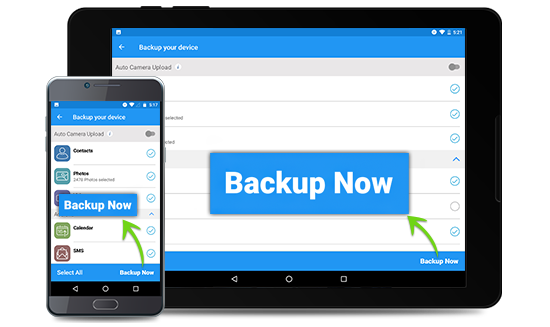 You can allow IDrive to perform automatic data backups by enabling the 'Backup on Charge' or schedule backup feature. Go to 'Settings' and tap 'Auto Upload'. Select the required data to backup and tap 'Done'. IDrive automatically backs up the selected data when the phone is connected for charging. IDrive performs this automatic backup once in 24 hours. Select the required data to backup and tap 'Next'. Set the parameters and tap 'Save'. On the IDrive app home screen, tap > 'Sync'. Tap 'Enable Sync' in the confirmation window. Tap 'Photos or Videos' or 'Other files'. Select photos/videos from Gallery or files from your storage devices. In 'Thumbnail' view, long press any file or folder. Select the files/folders, using . 1. On the IDrive app home screen, tap > 'Sync'. Tap the version you want to download. On the IDrive app home screen, tap > 'Settings'. Tap 'Manage Devices' under 'Security'. The list of linked devices appears. The list of linked devices appears. Tap corresponding to the device you wish to unlink, and tap ‘Ok’. You can browse, search and access all backed up files/folders in your IDrive account. Yes, you can access your mobile backup data through the web by logging to your IDrive account via any web browser. Select the folder with your phone name. Now, you can access Calendar, Contacts, Photos, Videos, SMS and Call Logs backed up to your IDrive account. Timeline displays all the photos and videos backed up from multiple mobile devices, sorted by date and location. However, to categorize your photos according to location, ensure Location is turned on in the device settings and also in the camera application while taking pictures and recording videos. Using Timeline, you can share, download, and delete your photos/videos, backed up with IDrive. To view a list of your photos and videos, on the IDrive app home screen, tap 'Timeline'. Tap and open the required media file. Tap . You can share the selected media files via email. This will restore the selected media files to your device. Tap 'OK' in the confirmation window to delete the selected media files from your IDrive account. Select 'My Device Backup' or any other mobile device folder. Enter the complete or part of the file name in the search bar and tap Enter. Tap 'Edit' from and choose files using . Tap and select the 'Add to Offline' option. Tap the 'Contacts' folder and long press a contact. Select multiple contacts to share by using . Tap the 'Photos'/'Videos' folder and long press any file/folder. Select photos/videos to share by using . IDrive provides a centralized location for all your shared files. 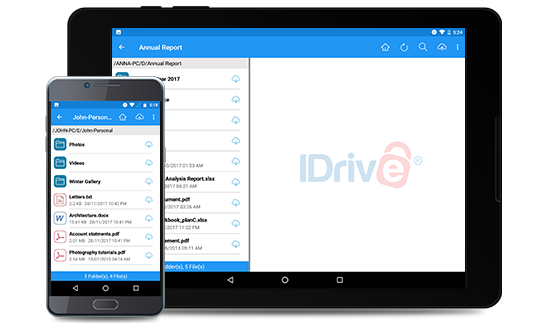 You can view the files that you've shared with others and the files shared with you by other IDrive users. The shared files pinned to your IDrive account does not impact your account's quota. On the IDrive Online app home screen, tap > 'Manage Sharing'. Tap corresponding to the folder you wish to restore. Select 'My Device Backup' or any other device folder. Tap corresponding to the 'Photos'/'Videos' folder to restore all your photos/videos. Tap 'Photos'/'Videos' folder and long press a file/folder. Select photos/videos to restore by using . Tap corresponding to the 'Calendar' folder to restore all your calendar events. Tap 'Calendar' folder and long press a calendar event. Select calendar events to restore by using . Tap corresponding to 'Contacts' folder to restore all your contacts. Tap 'Contacts' folder and long press a contact. Select contacts to restore by using . Tap corresponding to 'SMS' folder to restore. Tap 'SMS' folder and long press a message. Select messages to restore by using . Note: If you are using Android KitKat, make IDrive the default messaging app in order to restore your SMS. Tap corresponding to 'Call Logs' folder to restore. Tap 'Call Logs' folder and long press a log. Select logs to restore by using . Tap corresponding to 'Music' folder to restore. Tap the 'Music' folder and long press a music file. Select the music files to restore by using . Tap corresponding to 'Apps' folder to restore. Tap the 'Apps' folder and long press an app. Select apps to restore by using . Tap corresponding to 'Other Files' folder to restore. Tap the 'Other Files' folder and long press a file. Select files to restore by using . The files and folders restored from IDrive is stored in SD Card > IDrive_Download folder on your device. Enter a name for the new folder and tap 'Ok'. Long press a file and select by using . Change the name of the file and tap 'Ok'. Tap next to the filename, to cancel the upload. Long press a device folder, and then tap 'Delete'. Select the folder which contains the file to be deleted. Long press the file and select using . Read and Edit your text messages To backup and restore text messages. Network access, network and wi-fi connections To reach wi-fi and cellular network for backing up your data. Read, add or modify Calendar Events To backup and restore calendar events. Read/Write Call Logs and Contacts To backup, access, and restore your call history and contacts. Read Phone To get the device ID which helps distinguish your device. Accounts To access Play Store for making In-App purchases. No, IDrive will never save your information or share it with any third party. No, Play Store requires that you accept all the requested permissions for an app during the installation or when updating. Android doesn't allow individual or optional permissions. Therefore, all permissions must be accepted for successful download and use of the app. Note: For Android 6.0 and above, user will not be asked to accept any permission during installation of an app. However, while performing backup, restore, or any other action user will need to accept the required permissions. Tap the photo you want to share, tap and tap 'Share'. Enter the message and tap 'Send' to share the photo with your associates. * Note: For some accounts, certain features like People and functions like upload, create folder, renaming file/folder, copy, and move are not available.